Although WordNet comes with a graphical browser, it can only be described as bare-bones. The browser doesn't offer any kind of desktop integration, and there is no support for color coding, rich text formatting, or hyperlinking. But thanks to Artha, you don't have to put up with these limitations. This nifty little dictionary tool wraps the WordNet database into a user-friendly interface and offers a few neat features that can help you to make the most of WordNet. If you've ever used a dictionary application, you won't have problems figuring out how to use Artha. Enter a search term into the Query field, hit the Search button, and the matching article appears in the pane below. 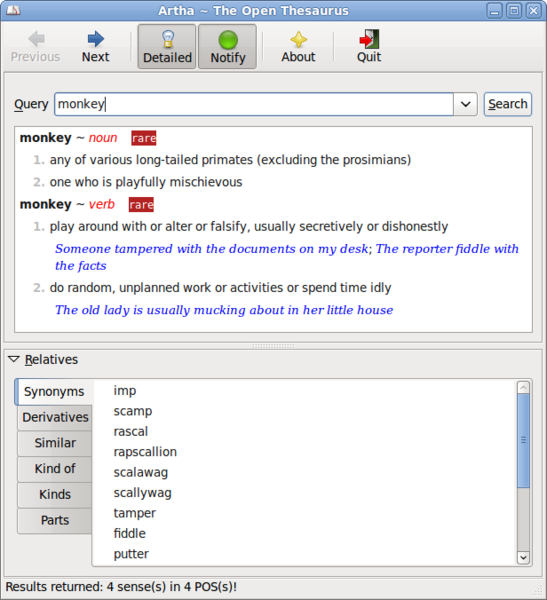 The Relatives section lists the related entries for the specific word, including synonyms, derivatives, similar words, etc. These entries are grouped into tabs, which makes it easier for you to view and manage the available data. Each entry in the Relatives section acts as a hyperlink, so you can use Artha as a sort of dictionary browser. For example, when viewing the "monkey" article you can look up the word "rascal" by double-clicking on it in the Synonyms tab of the Relatives section. Similar to a regular browser, Artha sports Back and Forward buttons which you can use to navigate through articles. In addition to the conventional search, Artha supports fuzzy searches using regular expressions such as wild cards, jokers, ranges, and limits. For example, if you want to find all articles that start with "monkey", you can use the * wild card, for example: monkey*. This returns a list of matching articles which include monkey -bread tree, monkey-wrench, monkey business, etc. Artha also comes with a few simple but useful creature comforts. If you enter a misspelled word into the Query field, Artha offers you a list of possible spelling suggestions. You can look up a word in Artha from within any application using the Ctrl+Alt+W keyboard shortcut which evokes Artha's window containing the matching article. Alternatively, you can enable the notification feature by pressing the Notify button in Artha's main toolbar. This way, Artha displays the definition of the currently selected word as a discrete notification bubble. @sil: Thanks for the commenting about the greyed out 'Query' field; it's fix is now been made and you can see it in the next release of Artha. I am unable to edit the "Query" field in the Artha window. Selecting text and Ctrl-Alt-W 'ing works perfectly, but the query field remains greyed-out, such that I am unable to edit it.